All right, so I definitely missed the step of telling you how we did in STORYHIVE voting, which I promised at the end of the last blog post. Good news! We won funding to make our web series pilot! And now it's made! Part of the amazing Stump Kitchen: Cooking For the Heart crew! Clockwise from left: Host Alexis Hillyard, Featured Guest Lynsae Moon, Producer/Director/DOP/Editor Andrea Beça, Lighting Director Jesse Nash, Production Assistant Mimi Kachope, Sound Operator Tyson Lenz, Second Camera Julia Grochowski, and Makeup Artist Corinne Simpson. Photo by Nanc Price. Stump Kitchen: Cooking For the Heart has been shot and is now in post-production. The rough cut is complete and I'm pushing into the next steps of editing - really focusing the story in, planning motion graphics and voiceover, etc. I am honestly thrilled with how it's looking so far, and beyond excited for what it's going to look like when it's complete! Can't remember what the web series is about? Let me tell you about it again! 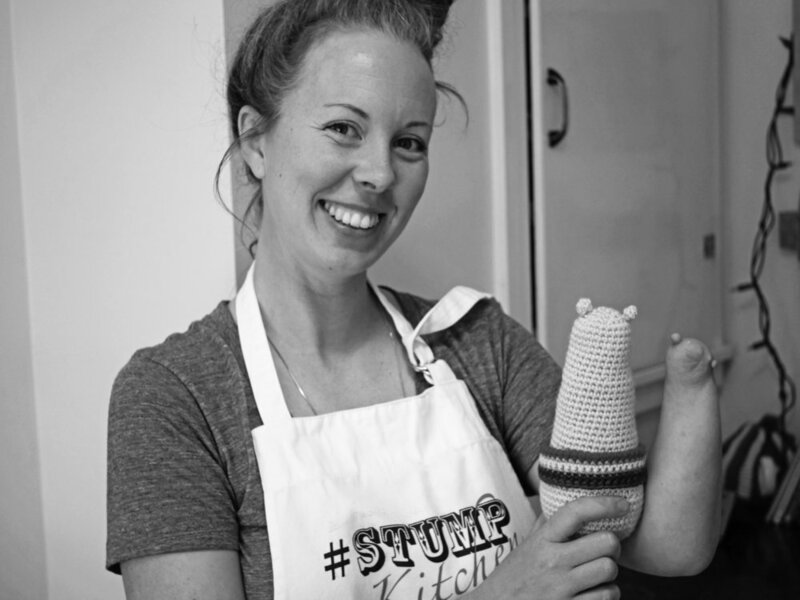 A lightbulb went off for me when I interviewed Alexis Hillyard, creator of the YouTube show Stump Kitchen, for my podcast, That's So Maven! One of the things that struck me as I spoke with Alexis was how cooking really helped her through periods of depression and how much joy Stump Kitchen brings her. That joy is evident when you watch the show, and it's infectious, too. I realized that throughout the course of my life, I've heard many chefs talk about cooking as a healing tool in their lives and instantly became curious about the Edmonton food community. I thought it would be really cool to interview five food industry professionals to learn about their "why," and how they create and nurture community through the work they do. And then I wanted to get them into the kitchen with Alexis to connect, teach, and learn. Alexis and Lynsae Moon, co-owner of The Nook Cafe and featured guest on the pilot episode of Stump Kitchen: Cooking For the Heart. Photo by Nanc Price. And that's not where the journey ends, either. Each featured guest on the web series brings with them what we call their "heart ingredient" - the ingredient that they feel is at the heart, or is the driving force, of their passion for cooking and food. It plays an important role in their cooking segment with Alexis, but it also moves forward with her from episode to episode. Alexis in the hot seat on set. Photo by Nanc Price. Episode 1 takes us to The Nook Cafe, where we meet co-owner Lynsae Moon, before inviting her into Alexis' kitchen to make a delicious toast feast. Why toast? You'll have to wait to find out when you watch the show! I will say this: Lynsae had some incredible stories to share with us. I can't wait for you to hear them. Lynsae at work at The Nook. Photo by Nanc Price. In addition to Lynsae, we already have a few amazing professionals from the Edmonton food community signed up to be part of future episodes, including Kasim Kasim of Padmanadi, Chef Steve Brochu or Chartier, and the Naidoo family, owners of Narayanni's. Kasim Kasim. Photo by Nanc Price. Chef Steve Brochu and Alexis at Chartier. Photo by Ebony Bird Photography. Selva Naidoo showing us how it's done at Narayanni's. Photo by Ebony Bird Photography. How can you watch this fantastic new web series? I'm so glad you asked! Our pilot episode will be live at STORYHIVE.com at the beginning of February. And in order to make the rest of the episodes a reality, we'll need your help. But don't worry, it's easy help to give! When the pilot goes live, we need you to watch it, share it, and vote for it every day for a week. If we can gather enough community support, we could win funding to produce the rest of the series. For today, though, all I hope is that you're as excited about this web series as I am. It's moving, thought-provoking, and incredibly inspiring, and I can't wait to share it with you. It's a lot of fun, too... Photo by Nanc Price. When the time comes to vote, I'll be right here to let you know. Now, time to get back to my editing suite! Stay tuned for Stump Kitchen: Cooking For the Heart. One thing I have learned over the last two years as a full-time freelancer (one of many, many, many things) is that creative personal projects tend to take the back burner - not by choice, but by necessity. A year after shooting The Disappearing Act, I am still working on editing it. Unfortunately, my paid work always has to take priority over it, because, well, I have to pay bills and eat! That being said, the rough cut is coming along, and I'm confident that the film will be ready for festival submissions in early 2018. And truth be told, the space and time away from the project has been beneficial to the editing process - I can approach the footage with a fresh set of eyes. If you were part of the process - cast, crew, and donors - stay tuned because there will be a VIP screening as soon as the film is complete! The last time you heard from me, I was pitching a music video to STORYHIVE. Sadly, we didn't win funding over the summer, but I am excited to announce that I am back on the STORYHIVE train with an idea I am absolutely thrilled and honoured to be co-creator on. Alexis Hillyard is rad as f*ck. I've known this for quite some time, and I've been an subscriber to her YouTube channel/show, Stump Kitchen, since it launched. She makes delicious vegan and gluten-free food (which happens to be exactly my food lifestyle), she's funny, and she's totally...herself. Alexis' show promotes self-love, imperfection, diversity, and inclusion - even moreso than I think she sometimes realizes. Watching Stump Kitchen makes me happy. It makes me feel great. And it gives me great recipe ideas. I recently interviewed Alexis on my podcast, That's So Maven!, and as soon as I left her apartment, I felt a pang of creative "OMG" in my gut. I knew there was a web series edition of STORYHIVE coming up, and I knew immediately that I wanted to collaborate with her. One of the things that I found just beautiful during my conversation with Alexis was how cooking really helped her through periods of depression and how much joy Stump Kitchen brings her. That joy is evident when you watch the show, and it's infectious, too. 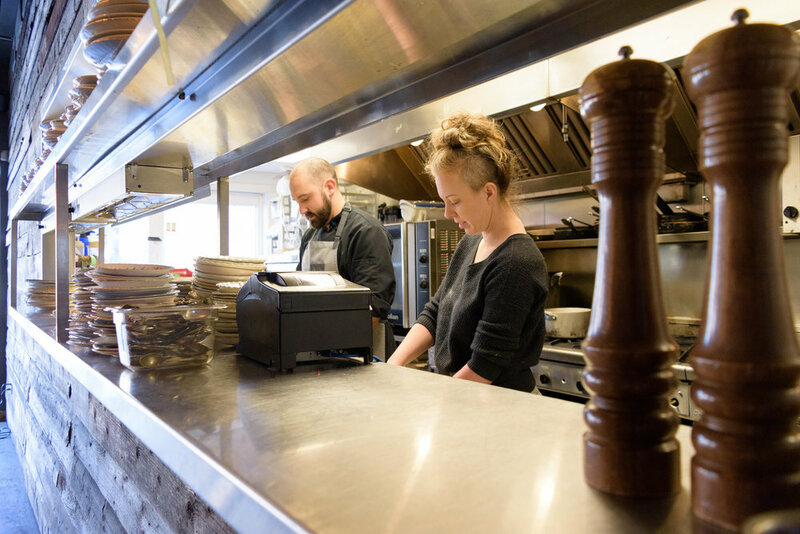 I realized that throughout the course of my life, I've heard many chefs talk about cooking as a healing tool in their lives and instantly became curious about the Edmonton food community. This sparked my first official STORYHIVE meeting with Alexis, which turned into our collaboration to pitch Stump Kitchen: Cooking For the Heart. A sort of spin off of her YouTube show, Stump Kitchen: Cooking For the Heart invites professional chefs from the Edmonton area into Alexis' kitchen to talk about how cooking heals and feeds their heart and soul. All while cooking delicious food and learning stump-tastic kitchen techniques. We've got some amazing local chefs and restaurants ready to take part and we've got an amazing team ready to make this series - including camera woman Julia Grochowski, composer John McMillan, and ASL interpreter Erin Burrell. We're also working to make the show as diverse, inclusive, and accessible as possible; every episode will have ASL interpretation and captioning. This is where you come in. In order for us to make this web series a reality, we need your votes. Voting opens at 1pm Mountain Time on Monday, September 18, and closes at 1pm Mountain Time on Friday, September 22. You get five votes a day, and you can only use one vote per project - so that means that in addition to supporting Stump Kitchen: Cooking For the Heart, we'd love for you to check out the numerous brilliant pitches in this round of STORYHIVE and show four others your love each voting day. And yes, you can vote every day. And we hope you will! Thank you so much for your support. This project is SO important to me - if you know me at all, you know how absolutely passionate and outspoken I am about women in film, diversity, and inclusivity. This project encompasses all of those things, and I know it's going to be a phenomenal web series. We just need to win some funding first! I'm off to stretch my voting muscles. I'll see you on the other side of September 22 and let you know how we did. Since our new STORYHIVE pitch is officially in the running to win $10K of funding, I thought it would be a good time to introduce y'all (see what I did there?) to the team of people who will be bringing the "Synth Cowboy" music video to life! First things first, the band behind the song: meet Brother Octopus! Brother Octopus has five members: from top centre, going clockwise, there's Brother Octopus, New Guy, Dogfish, Golden Boy, and Little Guppy. The song we're turning into a music video, "Synth Cowboy," features the vocal stylings of guest singer Jake Ian (left). Who's that weirdo in the red cowboy hat, you ask? Why that's me, Andrea Beça. I'm the founder of Kissing Habit Films, and I'll be directing, shooting, and editing the music video we make when we get funded by STORYHIVE (with your help)! I've got a fantastic team of humans helping me with the behind-the-scenes work that will go into "Synth Cowboy." Julia Grochowski, whom you may recognize as a filmmaker in her own right, as well as from the plethora of work she's done with Rapid Fire Theatre, will be Assistant Director. Jesse Nash will be joining me once again as Lighting Director on the video. Beyond working on my previous STORYHIVE project, nightwalk, Jesse has worked with Brother Octopus before, so this project will be a fun way to bring us all together. Another key player in the music video? Our location! If we get funded, we're hoping to film the music video at The Weathered Barn Farm, owned by Allison and Marty Franke! Now that you've met the team, I hope you'll take a moment to VOTE for "Synth Cowboy" on STORYHIVE, and to spread the word! Voting is open until May 1st, and you can vote every day. Thanks for all your support! I'll do my best to keep you updated as the project moves forward. I mentioned at the end of our big March update that I was diving back into the world of STORYHIVE and I'm here today to give you all the exciting details! Brother Octopus is one of my favourite local bands. Beyond the fact that their music is amazing and always gets me moving, they've been incredibly supportive of my film life; Nathaniel, the band's lead singer, A.K.A. Brother Octopus, has been so generous in lending music to multiple projects I've worked on over the last few years. So when I saw that STORYHIVE's next edition was devoted to music videos, I knew exactly who I wanted to work with. Brother Octopus and I need your support to make our music video collaboration a fantastic reality! If you watched the above video, you know that we're getting a little bit Western and a little bit Electronic to bring you..Synth Cowboy! The video is going to be SO much fun. It'll be shot at a farm just outside of Edmonton. You read that correctly: we're not messing around about the whole "cowboy" thing! You can check out our full pitch page on the STORYHIVE website. Voting is open from now until May 1st at 1pm MST, and you can vote each day. Please vote for us, and please help us spread the word! And stay tuned to the Kissing Habit social media channels (Facebook, Twitter, and Instagram) for all sorts of fun content throughout the week! Thanks for reading! I hope to be writing about our music video shoot in the near future! To say there's a lot going on for Kissing Habit films would be a bit of an understatement! Things have definitely been busy, and I have a lot of exciting news to share, so let's dive right into it! I want to extend a HUGE thank you to everyone who supported nightwalk during the STORYHIVE competition. While we didn't win the "top prize" in Alberta (which went to the very deserving, "This is Not a Passport Photo" - if you haven't watched it yet, do so now), in my mind, the real prize was getting to make the film, and we did that, and that is a huge, fantastic opportunity. The next step for nightwalk is, I hope, film festivals. It's been submitted to a number of genre and related film festivals, and the waiting game for results is on! So make sure you stay tuned to our social media accounts to be the first to know where and when it's being screened. It's also available on Telus Optik Local TV. The Disappearing Act, which got put on hold when nightwalk won a spot in STORYHIVE, is now back in post-production. It's definitely behind schedule based off my original plan, but there's no chance I'm going to rush it and have it be anything less than the beautiful and moving story I know it is. I'm currently working on a sneak peek of the film to submit to the next episode of Metro Shorts here in Edmonton, so if you're curious about the film, that's a good opportunity to catch a glimpse; it won't be publicly available for a while yet. Again, keep an eye on our social media - I will be sharing sneak peeks and behind-the-scenes shots as work on The Disappearing Act progresses! Doing two rounds of STORYHIVE in a row would be a recipe for madness, right? I'm teaming up with one of my favourite local bands, Brother Octopus, to work on a new music video, and I think you're all going to love it. It's very...Albertan. And that's all I'll say for now. More details as they become available! From pitching to voting to pre-production, production, and post-production, and now we arrive at...voting again! But this time, you get to actually watch the finished result: nightwalk. Our 10-minute horror short will be online for your viewing pleasure starting on February 6, which is one week from today. So, what will you be voting for? If you like, the film, I ask that you show your support by giving it a vote. You can vote once a day, every day from 1pm MT on February 6 (Monday) to 1pm MT on February 10 (Friday). One winning team lead from each of the participating provinces (Alberta and BC) will get to represent their project at the Banff World Media Festival in June. This festival will be a huge networking and learning opportunity. It could lead to a lot of exciting future projects, or to nightwalk being shown in even more places, or to any number of other amazing circumstances. While the film has been made - which was my biggest hope and goal when I pitched to STORYHIVE - I would be absolutely thrilled to have an opportunity to take nightwalk (and all my other work and experience) to Banff to continue to pursue this love and dream of mine in any way I can. Thank you again, from the bottom of my heart, for your continued support. I can't wait for you all to see nightwalk next week! Then I remembered that as a Writer/Director/Producer/DOP, there was no way I'd surface during the process until it was over. I am proud to say that nightwalk has been shot and edited and it's now living at the TELUS STORYHIVE offices in Vancouver (well, one copy of it, anyway) until it goes live through their channels for another round of voting. But before I get too far ahead of myself, I need to give a shoutout to my post-production crew. And how handy that I can do so with one fantastic photo because they're married! I wanted to write this post just to take a minute to acknowledge the work that went into nightwalk. The cast and crew braved incredibly cold temperatures and late nights to make it happen, and over 350 volunteer hours were put into principal photography alone. In the end, what everyone will see is a 10-minute short. They won't see the hundreds of hours - and four months - that happened behind the scenes to make it a real thing. That's the magic of filmmaking. And I think it's important to express my gratitude to everyone who played a part in nightwalk, and to say that I am very proud of the end result. I know I've mentioned this many times before - whether I've mentioned it on the blog before, I'm not sure. I was a bit skeptical of STORYHIVE. I've never been big into contests. But TELUS was beyond phenomenal to work with, and this whole experience has been so positive. I'd do it again in a heartbeat (okay, not a heartbeat - I need to get some sleep), and I hope to. Once I recover a bit more from the sheer intensity of the experience - and once the film is out and I don't risk sharing any spoilers - I'll have more stories to share from the process! For now, all I can say is get ready to vote. You'll be able to watch and support nightwalk starting February 6 at STORYHIVE.com. As I mentioned in the last post, we are deep into the pre-production of nightwalk and principal photography starts on December 2. Rekha Kapadia will be playing the lead role of Aatisha, a confident young woman whose life is put on edge when she realizes she's being followed and photographed by a mysterious figure who lurks in the shadows. David N.O. will be playing Scott, Aatisha's new boyfriend who gets more than he bargained for when he becomes entangled in the predator-prey relationship Aatisha finds herself in. Rounding out the cast of nightwalk, Sam Jeffery will be playing Aatisha's best friend, Jo. She's known Aatisha for a long time, and she's not sure what to make of her new boyfriend, Scott. There's lots more to come from the nightwalk team. We'll introduce you to the behind-the-scenes crew soon, and keep you updated as we get closer to principal photography! Lots going on at Kissing Habit Films! I figured it was high time to do a big update on both The Disappearing Act and nightwalk. First off, thanks to everyone who voted, nightwalk was awarded STORYHIVE funding! I'm very excited to say that we have almost all of our shooting locations confirmed, as well as our entire cast and crew. I'll introduce you to the cast in a separate blog post. For now, just know that we are working hard and getting super excited to head into principal photography on December 2! Now, I know what you're thinking: What the heck happened to The Disappearing Act? I haven't forgotten about it! We had an incredibly successful shoot at the end of August, and the film - on pause during the STORYHIVE pitch and production process - will be entering post-production in December. That means that I will be editing my heart out in a few weeks to bring the story together, before working with our amazing composer and sound mixer, Tony Bao, to finish things off. We're still on track to have the film ready to submit to festivals in early 2017, and I am also looking into a special private screening for the cast, crew, and everyone who supported The Disappearing Act's production. Which leads me to my next discussion point: the bottle drive! Thank you so much to everyone who donated bottles towards the production of The Disappearing Act. Over the course of approx. two months, we were able to raise a total of $954.35, which helped us cover the rental of our hospital location, as well as some other production expenses (equipment rental, craft services, etc.). I am so incredibly grateful to each and every one of you who believed in my short film enough to throw us your empties - and in some cases, make a straight up cash donation. Again, thank you from the bottom of my heart. We could not have done it without you! That's all for now. In the next post: meet the cast of nightwalk! nightwalk poster and location photos by Andrea Beça; poster design by Patricia Begley-Nelson. All photos from the production of The Disappearing Act by Lauren Dary of L Photography. Before I dive into nightwalk, a quick moment to say that we've got a big update on The Disappearing Act coming soon, so please stay tuned for that! What is nightwalk, you ask? nightwalk is the short film I've pitched - with the help of an amazing team - to the most recent round of STORYHIVE, a contest run by Telus Optik Local that will result in 15 teams from Alberta and 15 teams from BC receiving $10K to make their movie happen! nightwalk is centred on Aatisha, a young woman who, late at night, making her way to her car, discovers a digital memory card on the ground. When she gets home, she pops it into her computer and realizes that the card if full of footage...of her. This round of STORYHIVE is all about the female director. While I think it's a great initiative, I think we need to do more than just "force" teams to hire a figurehead female director in order to participate. As as female directors, we have a duty to lift up our fellow women in film. That's what I'm doing with this pitch. I've assembled a core team of incredibly talented women to work on nightwalk with me. They are: Corinne Simpson, my assistant director and makeup designer for the project; Sarah Taylor, editor extraordinaire; Patricia Begley-Nelson, who has done all of the graphic design for the project so far, and Rekha Kapadia, our lead actor and focal point for the entire film. If we win the funding, I will strive to hire as many women I can on the production team, as well as look into mentoring young women in the industry, so that we can expose them to a number of "on-set" duties. Basically, it's going to be amazing. And we need your help. Go to the nightwalk page on STORYHIVE and vote for our project to receive $10K. Check out our pitch video while you're at it, to catch a glimpse of all of our beautiful faces. And now, what is perhaps the most important part: please vote every day until 1pm (mountain time) on Friday. You can vote once per project per day, so we need you to go back to STORYHIVE every day to keep voting for nightwalk! I'm so, so, so excited at the possibility of making nightwalk a reality. It's a story that's been living in my head for over three years. I think we have a strong pitch and a strong team, and I hope you will join us on this crazy journey and help us make it happen! Vote, vote, vote! Results will be announced on October 6. All photos in this post taken by Andrea Beça; poster design by Patricia Begley-Nelson. The Disappearing Act Needs YOU! Long time, no post! Sorry about that. Making movies is time-consuming! We are deep in pre-production mode for The Disappearing Act. Table reads, photo shoots, making props, creating shots lists, and confirming locations - it's all happening. In fact, just yesterday, I confirmed the perfect location, but now this little film company needs your help. Here's the thing: a crucial part of The Disappearing Act takes place in a hospital. The entire story is book-ended by this location. It's not the sort of thing that can be improvised or done half-assed. It needs to look and feel real. I've found a place that works, that's available, and that will allow us to shoot, but it looks like it's going to cost between $600-$750 to rent it. This isn't a real hospital. Neat, right? As I mentioned a couple months ago, we didn't get the grant we applied for to make this film, but I decided to push through because I know in my heart of hearts that now is the time to tell this story. Making the decision to bring this film to life also meant making the decision to fund it out of my pocket. I am a huge believer in paying people for their time, even if the rate doesn't measure up to a big budget project. It's a sign of respect: for a person's time, craft, and professionalism. So, with the exception of a couple of volunteers (one of whom is myself), everyone working on this film is getting paid. I put together a very modest budget, and I've scraped together the funds to make it happen. A $600-$750 location was not part of that budget. And I just can't make it work on my own. I know this has been a rough year for, well, basically everybody. Times are tight. The economy is...you know. All we have to say to each other is "the economy..." and we get it. So instead of dollars, I'm looking for bottles. That's right. Kissing Habit is going old school and we're having a bottle drive. We will take your empties off your hands, and in exchange, your name will end up in the The Disappearing Act's closing credits. If you donate over $75 of bottles, I'll also give you an exclusive password to view the film online when it's finished (somewhere in the December/January timeframe), before it goes public (I'll be putting it through the festival circuit before it's widely released)! Not bad, right? If you have bottles to donate, please email kissinghabit@gmail.com. I will pick them up and take them to the bottle depot - you don't have to lift a finger! (Well, except for the fingers you have to lift to email me - sorry about that.) I am arranging pickups starting next Tuesday, August 16th. EDITED TO ADD: The amazing folks at WEPhysio have agreed to let us use their business as a drop-off point for bottles, so if you want to donate and are able to pop by and leave your bottles and your name (for a thank you credit in the film! ), you can do so at 11152-142 Street between 7am and 6:30pm, Monday to Friday (7am to 4:30pm on Wednesdays)! If you're feeling philanthropic and you want to take the bottles to the depot on our behalf and donate the funds, you are amazing! It's not necessary, but you are amazing! If you're feeling like a magical unicorn and you want to make a straight up monetary donation without any bottle business, you are so amazing that you are basically Tom Waits (if you know me at all, you know just how amazing that is). The place to get a hold of me with any questions, comments, concerns, dollars, and/or bottles is kissinghabit@gmail.com. We may also throw a little party in a couple weeks. So stay tuned for more info on that. Thank you for caring enough about my indie film company and my indie film to read this. Thank you for your bottles. Thank you for your support. Thank you for your time. I am so grateful that making this film is a part of my life. I've been quiet on the blog front because I was waiting to hear back about a grant before really talking about the next film we're shooting with Kissing Habit. We didn't get the grant, but we're still shooting the film. I don't intend for that to sound like a "f*^K you!" to the system or anything. On the contrary, I will be applying for many more grants from many more funding bodies, and I hope to receive many of them, so that I can continue to make the art I love to make. What it really boils down to for me is whether I want to wait, or create. Since this film's story has literally been sitting on my heart for almost nine years, I decided to create. This story means the world to me. The time is now. The Disappearing Act is a short film based on a short story with the same name. It introduces us to Laurie, a woman who deals with her recent losses in a unique - and often haunting - way. The story itself has been published multiple times, and was nominated in 2009 for both an Alberta Literary Award and the Writers' Trust of Canada Journey Prize. Before I got into film, my work was often described as cinematic in quality. When I wrote The Disappearing Act, I envisioned it as a short film. I am excited beyond words that now I get to make that happen. I'm going to dive into who's involved and what their roles are in a future post. For now, you can just admire how gosh darn good looking everyone is. The screenplay is done. The shooting dates are scheduled (oh, right, I should email everyone about that...). We've got a wee bit more cast and crew gathering to do. 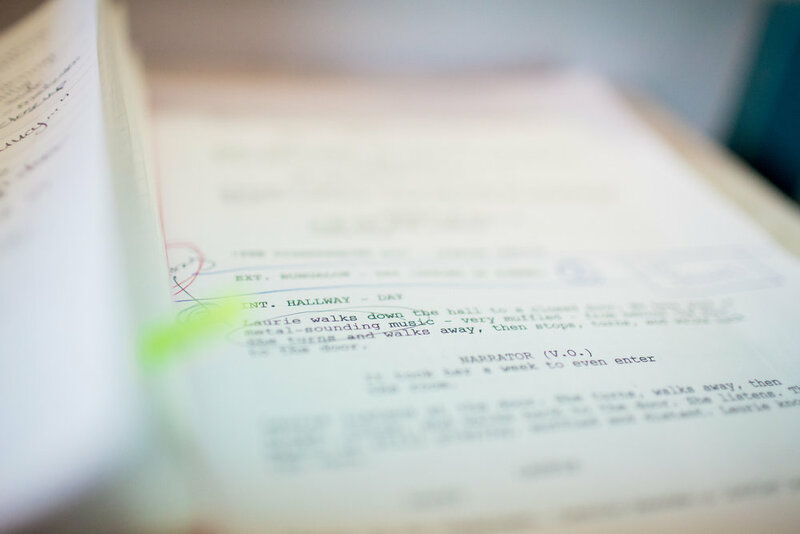 Pre-production is in full swing as I start to get organized with props and costume lists, location scouting, shots lists, scheduling, and the million other details that go into a film shoot. It's 2016, and I'm very excited to start the year with a brand new Kissing Habit Films website. I know it seems like the last year has been pretty quiet for Kissing Habit, but as you may guess, now that you've found yourself here, there's been a lot going on behind the scenes. So, what's coming up for Kissing Habit in 2016? A new short film. We're in the pre-production and planning phases for The Disappearing Act, which will be shot early this year. I'll keep you all in the loop as we move along. For now, I'll just say that I am excited beyond words to get this film shot and made. I've been dreaming about it since 2008. Thank you for stopping by! I hope you'll do so often - there will be more to read here very soon. © Kissing Habit Films, 2017. We won't give your info to anyone else. You have our word.